Fourteen of Ramsay's best cooking tips — from effortlessly peeling kiwis to quickly ripening fruit. If there's anyone who knows how to cook a great meal, it's Gordon Ramsay. So we rounded up 14 of his most helpful cooking tips you can use in your own kitchen — from perfectly peeling garlic to making decadent scrambled eggs — to turn you into a master chef. 1. Adjust the coarseness of your black pepper by loosening or tightening the nut on your pepper mill. While this may seem obvious to some, adjusting the coarseness of your pepper is as easy as tightening or loosening the nut on your mill. Coarse black pepper is best for things like steak where you want a crunchy texture with intense flavor, and finely ground pepper is best for smooth sauces where you want a more mellow flavor without any texture. 2. 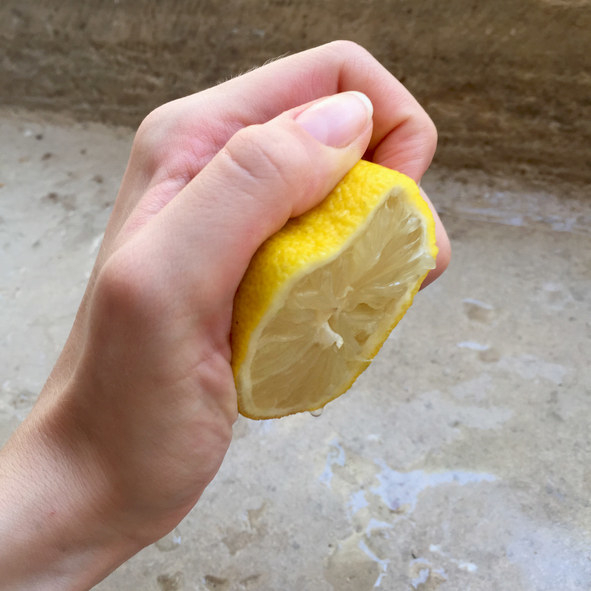 To get more juice out of your lemons, roll them on your counter before juicing them. This helps break down their insides a bit so you can easily juice them — so don't be afraid to apply a good amount of pressure when rolling them. This trick also works with limes, which are typically even more difficult to juice. 3. 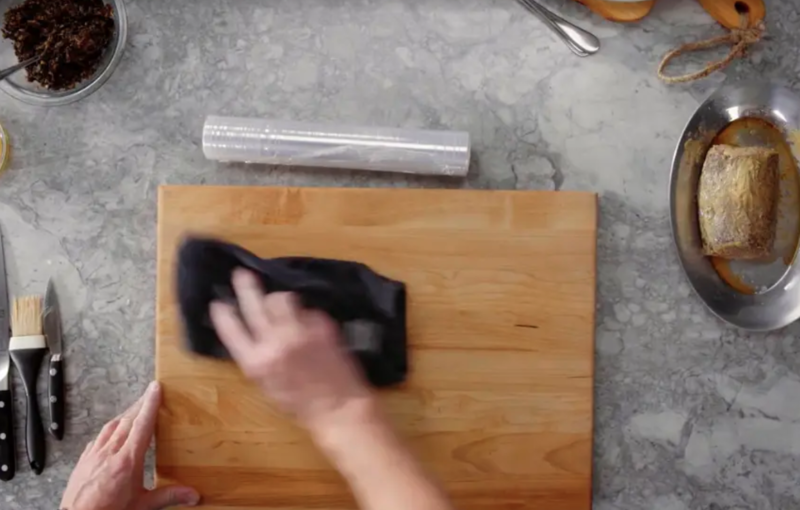 Whenever you're using cling wrap, lightly wet your chopping board to prevent it from sticking. 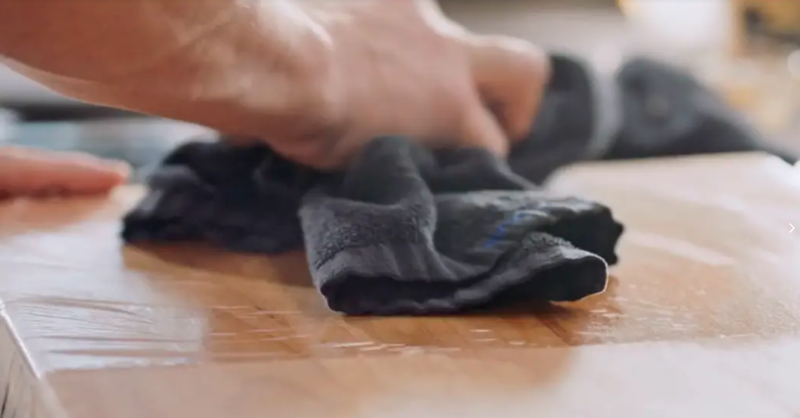 This will help make sure it's not sticking to the things you don't want it to stick to (aka your board) — just make sure you're not using too much water, which will make things even more difficult. 4. Whenever you cook with foil, make sure the shiny side is up. If you didn't already know, aluminum foil actually has two sides. The dull side insulates heat better, so you want to make sure that's the side that's touching your food — while the shiny side should be facing out. Check out Ramsay's MasterClass for even more of his pro tips. 5. Whenever you make mashed potatoes, boil the potatoes with their skin on and peel them while they're still hot. "The secret behind making a great mash for me personally," says Ramsay, "is keeping the skins on. The skins protect the potatoes, therefore it doesn't absorb all that water." So the next time you make mashed potatoes, do like Ramsay does and peel them after they're cooked so you don't end up with a watery mash. 6. When mincing garlic, add a pinch of salt to your cutting board to help break it down. The salt acts as an abrasive and "helps break the fibers of the garlic down." This comes in handy when you want to chop it as finely as possible for things like smooth sauces and purées. 7. Finish your scrambled eggs with cold crème fraîche to quickly cool them down and prevent them from overcooking. This simple trick, which went viral after he demonstrated it on an episode of MasterChef, quickly cools down the eggs so they stop cooking and adds additional fat to keep them creamy. Ramsay also swears by cooking them in a pot, but the cold crème fraîche trick can be applied to just about any scrambled egg application. Watch Ramsay make his signature scrambled eggs. 8. Stick your cheese in the freezer for 10 minutes before grating it. This will help firm it up so you're not just smashing it against the grater. 9. Instead of picking herbs off the stem one by one, use a knife to quickly shave them off. Just hold your herbs upside down and gently shave the leaves off with a sharp knife. You'll end up with a few stems still attached, but you'll be able to pick them out much quicker than picking them individually. 10. Use lasagna sheets as a go-to pasta shape — not just for lasagna. Similar to tagliatelle, lasagna sheets are an ideal pasta shape to pair with thick, hearty sauces. It allows you to get the perfect ratio of sauce to pasta and can stand up to hearty sauces like ragù. Ramsay pairs the sheets with a hearty mushroom sauce, but they would be great with a variety of other thick sauces. Watch Ramsay make mushroom, leek, and tarragon pasta with lasagna sheets. 11. Effortlessly peel kiwi by using a spoon. Just cut the kiwi in half, then run your spoon between the skin and the flesh to easily separate it. 12. 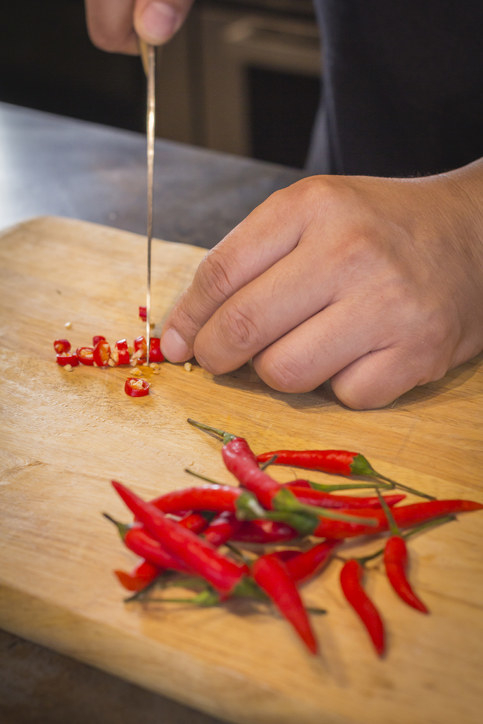 Rinse your hands in lemon juice after cutting hot peppers to get rid of the burn. If you've ever rubbed your eyes after cutting hot peppers, you know how painful the experience can be. To help get rid of the lingering burn, Ramsay suggests rinsing your hands in fresh lemon juice after cutting hot peppers. According to Ramsay, "they’ll cool down instantly!" 13. Quickly peel an entire head of garlic by smashing it and shaking it between two bowls. Lightly smash the garlic head against your cutting board, transfer it into a bowl, place another bowl on top, and shake for 10 seconds. The skins will detach from the cloves and you'll be able to easily separate them. 14. Quickly ripen fruits by storing them in a brown paper bag with a banana. This helps concentrate the ethylene gas, which in turn will help ripen the fruit much quicker. Some fruits can ripen in as little as one day using this method.